TYPE: 2-Door Coupe, 2-Door Convertible. OCT 1996 Jaguar XK8 4.0 (290 bhp) rear wheel drive Coupe and Convertible launched in UK with 5-speed automatic transmission, independent double wishbone suspension, anti-lock brakes and power assisted steering. Equipment includes alloy wheels, electric windows/mirrors, air conditioning, electric seat adjustment, electric hood (on Convertibles), choice of Sports or Classic interior trim (with optional leather upholstery). CATS active suspension system optional on Coupe. OCT 1997 CATS suspension package optional on Convertible. Revisions: light sensitive headlamp switching; auto dipping rear view mirror. MAY 1998 XKR 4.0 Supercharged Coupe and Convertible (370 bhp) launched with uprated CATS suspension, 18" alloy wheels, Sport Leather pack, cruise control, headlamp washers and CD autochanger. 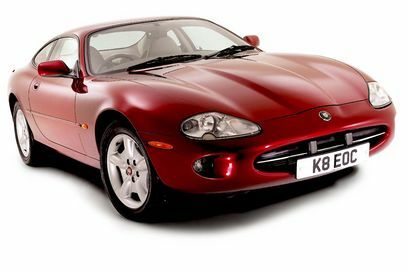 SEP 1998 Revisions: Servotronic II power steering and detailed engine modifications on XK8. The current XJ Series continues the fine Jaguar tradition. V8 engines have transformed this big Saloon for the better as has the cramped interior. Absolutely obedient handling with a superb 5-speed automatic gearbox make this a real drivers car. The XK8 is a Grand Tourer for the Millennium, brilliant ride, refinement and sky-high image. One of the worlds most desirable cars also the most-fun since the E-type.